Do you know what happens if you use expired makeup? Do you know when you should throw out your makeup? But, all makeup products are meant to last a certain amount of time. And once that time has passed, the product becomes less effective and more prone to forming bacteria. Considering how sensitive of an area our face is (especially our eyes), bacteria is totally not welcome! But, how do you know if makeup is expired? 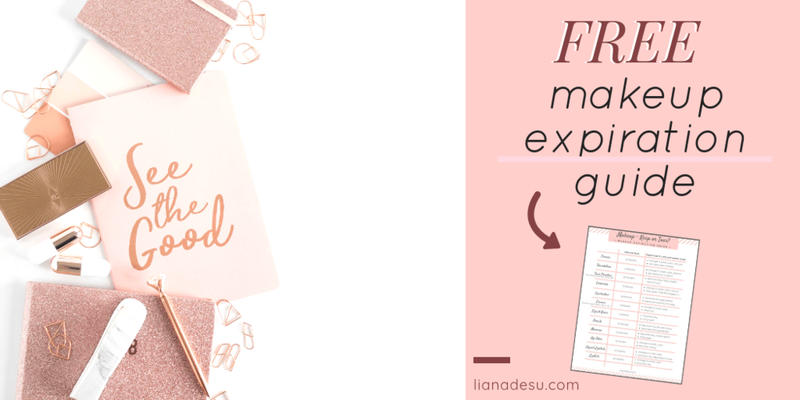 In this guide, I’ll share with you how to know if makeup is expired, how long each product generally lasts, how to check expiry dates on cosmetics, and there’s a freebie at the end! Typically, a primer should last up to 24 months, especially if packaged in a squeeze tube. If packaged in a jar that you have to stick your finger in to get to the product, bacteria can grow much quicker. I’d recommend using a spatula for primers in jars or make sure your fingers are super clean! It definitely needs to be thrown out if you notice a change in smell, color, texture, or if your skin begins to experience irritation while using the product. Liquid Foundations should be good up to 12 months or if you notice a change in the way it smells, its texture, or its color. If you are prone to acne, you may want to consider changing your foundation as early as 6 months from time of opening. All of these face powders should last 24 months or even longer. It’s hard to tell when these products become expired, but a good indication would be when the powder becomes dry, flaky, or starts cracking in the pan. Because of its close proximity to the eye, extra care should be taken when it comes to concealer, especially those with a doe-foot applicator. The applicator is constantly coming into contact with your skin then going straight back into the tube, which creates a breeding ground for bacteria! A liquid concealer should last up to 12 months, but if you notice a change of scent, consistency, or color, it’s time to toss it. This is similar to the face powders I mentioned above – powder eyeshadow will typically last 24 months or longer. In my experience, eyeshadow can last a VERY long time. When it starts to become less effective and starts to crumble, that is a good indication that it should be thrown out. Any type of cream makeup should last between 12-18 months. It’s time to throw it out if the texture begins to change. Creams drying up is a good indication that it’s time for a new one! Liquid liners get very close to your eye, so it’s a good idea to get a new one every 6 months. Brush tips and felt tips can really get covered in bacteria after a while! Pencil liners (both eye and lip) should last up to 24 months. Sharpen them regularly to keep them fresh and always use the plastic cap it comes with. If the pencil starts to get dry and break, or if it’s not working as well, it’s time for a new one! I personally never keep a mascara for longer than 3 months, however the general guideline is to toss a mascara after 6 months. Just like concealers with a doe-foot applicator, each time you use mascara, the wand is exposed to bacteria, then it is put back into the tube. Breeding ground for bacteria! Once it starts to get dry, it’s time for a new one – no one likes clumpy mascara anyway! These products pose the same vulnerability as the other products with similar packaging. With every use, the wand is exposed to bacteria then put back into the tube. A lip gloss or liquid lipstick should last up to 12 months, but it’s time to toss it if you notice a change in smell, if it starts to separate in the tube, or if the consistency has changed. Lipstick is good for up to 24 months – yay! I know we all have our favorites and would hate to have to constantly get rid of them. Be sure to secure the cap well after each use! If the color starts to change or it becomes dry, it’s time for a new one. While this list is a great general rule-of-thumb for makeup expiry dates, all products are different, so I’d definitely recommend looking for this little symbol on your makeup. Tip: Keep a permanent marker in one of your bathroom drawers or makeup bag, and write the date on every product when you open it. You’ll never have to wonder how old anything is! So, did you go grab your makeup bag and get rid of everything that was expired? If not, go do that right now! As an easy reference guide, I have created a free printable chart of everything I discussed in this post. Click on image or button below image to get yours now!